Peter asked that I tell this story from our dating days. It begins in the laid-back land of Southern California where entire cities don’t push to cut their way through throngs of cars on impatient legs, daring drivers to run over them. Pedestrians actually keep to the crosswalk and – to the stupefaction of visiting New Yorkers – can be ticketed for jaywalking. Most parts of the west coast, in fact, don’t see people milling in masses – simply because they don’t walk. In the state formed out of freeways, your wheels are your feet. California streets also aren’t so talkative as crowded eastern cities are, with their slew of parking signs that dictate when and where vehicles may stop. In love with the girl who had disavowed the fast pace of New York for the peace of the Pacific, California Boy flies out for her old stomping grounds to ask her father for her hand in marriage. She jump-starts her reunion with her parents and the love birds plan to meet in the City the morning he arrives. It is Peter’s first taste of the Big Apple. The first thing to overwhelm him at Grand Central is the moving multitude. Never has he seen so many…people. In such a hurry. Everywhere. Struggling with the luggage he realizes he doesn’t have the hands for in a place where most go on foot, Peter somehow drag-pushes it all out of the station to the sidewalk, hopeful for a taxi – when he notices the No Standing sign above his head. I’m not supposed to stand here? How…do I flag a cab, then? 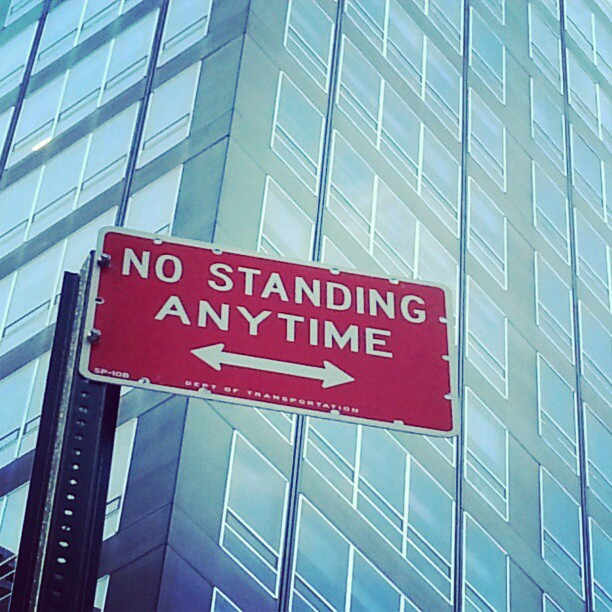 But it says no standing. Anytime. Oh, what if I get a ticket? He looks to the left, looks to the right. California Boy shuffles the mountain of bags a few yards this way. Looks around. Some minutes later, a few yards that way. His heart quickens. He keeps up the goofy dance until he makes the connection between the light atop the cabs and the vacant backseat. That’s how you grab a taxi. Relief. He hails a car and slumps in the backseat. My friends and family were rolling, doubled over, when Peter shared his first nervous moments in the urban East. He’d had no idea the No Standing was a prohibition against vehicles looking to park there. If pedestrians were ticketed in New York, the city would transfigure into a ghost town. I’ve never given thought to the sign until this writing. Having grown up with it, it never occurred to me that someone could think it applied to anyone other than drivers. Do you have these signs where you live? While we’re at it, here’s a glimpse of a fun memory from the trip. We had a blast swing dancing in the city, a night out on the town. You see, it was at a ballroom in California where we had met. This entry was posted in Personal Growth and tagged California, City, Culture, Dating, English Language, New York, NYC, Travel, Words. Bookmark the permalink. Thanks for letting me know! My guy will feel better! You mean always thought this? In which part of the world? Where you grew up? LOL! Actually, I can see how a child would process the no WAITING. So both those places had that sign? I have a tendency to mix up what I’ve seen where to be honest. I just know I’ve seen a lot of signs that have bothered me and thanks to your post I’m starting to realize that I may have misunderstood their purpose. Chuckle. It really bothered you as a kid. How funny! I had never thought about that sign that way! Poor Peter! Thank you for sharing. Ha ha ha. He (finally) should feel better from these comments. Thanks for pulling up a chair today! Where is “here”? Where are you? Thanks for the sweeet support, C.
And your blog is beautiful, btw. What a great story. I have been surprised by signs all over the world. I actually photograph them often. My favorite one so far was a pedestrian crossing sign in Saudi Arabia where the familiar yellow sign with black stick figures crossing the street was actually clothed in the local abaya dress. Interesting: clothed in abaya. Wow, what an album you can make put together with all those shots from around the world. Thx for the read! Great, thank you for letting me know. If you want the photo of the sign I’d be happy to send that to you. No. Copyright issues as a guest. Thanks for the offer, P.
Nice photo of you both. I remember a quote from college public speaking class days which indicated correct English is that spoken and understood in a particular part of the world. It is not what is dictated from the learned halls of Oxford or Cambridge. (Or Harvard) That means English words will have different meanings in Hong Kong, Singapore, Philippines, and any other part of the world where English is spoken. Fortunately there’s enough understanding within sentences to get us all by as we communicate across the world. And English is a dynamic language that borrows enormously from almost every major language on earth. In the year 2050 they will probably need a Professor of Antiquities to translate what we speak today! So I guess the two cultures East and West US will just have to use their wits about them as they travel back and forth. lol. Interesting to me, a former Linguistics college major and Classical Studies minor. Gosh, it was such a short sign: NO STANDING. Maybe that was part of the problem. Needed more explanatory words lol. I live in Virginia, and we have these signs too, except they say ‘No Stopping, Standing, Parking at any time’ … Ironically, I must have been the only person who paid any attention in Driver’s Education class, because THAT is where I learned the meaning of this sign… and NO ONE I have asked since then has known that ‘standing’ is actually the term for being IN the car, with the motor OFF. Stopping is inside with motor running, and parking is shutting off the car and leaving it. This is great—and truly accurate! Ha ha ha thanks for the read. Lol! As a NYC office-goer I never saw the sign in that light. Heck there are so many signs on the streets here that we pedestrian’s barely look at it and jaywalk and scurry like ants. I know exactly what you do and don’t do over there. I could not help laughing at Peter’s plight though I feel his dilemma. You see, I am caught in such situations too often. But I have barely had time to look up at signs since I stepped into NYC. I am mostly to be found gawping at things happening in front of me because it is just so busy. Ha ha ha. Bc I grew up there, the (crazy!) busyness is ingrained in me and I didn’t get why he was so overwhelmed with the place, with the crowd, with all of it. And he kept saying there were so many PEOPLE everywhere. (Not many pedestrians, many parts of Southern CA.) I look fwd to keeping up: have fun, and don’t forget to look up time to time! You’re right about the more hands-on experience of a place with the walking. It’s ridiculous how you need to get in the car heading for the plaza next door here. I long since have become a stranger to NY. First left for Univ of PA, so it’s been decades. After a few yrs out here, I noticed I move more slowly in CA. But on that rare visit back, I was cutting through the crowds like any sharp, harried NYer. =) It was still in me, ha ha ha. I know I’ve kept the sharp words, LOL. Chk out Chinatown if you haven’t. I didn’t go often but everything is cheap, incl the yummy food. And man, they have killer cannoli in Little Italy. The sharp words! The famous groove of the New Yorker eh? I am happy to have not been at the receiving end yet. Lucky escape. Our first visit in NYC was Chinatown thanks to our banking needs. It was delightful and I did do a post on it though mine hovered on nostalgia about Calcutta’s Chinatown too. Below is the link for it.